“Insidious” was one of the more memorable horror entries in the genre to come out in quite some time. It was a low-budget ghost story with relatable characters, an interesting story, and most importantly well-earned frights. A sequel was inevitable but while the “Back to the Future Part II” type hijinks were fun the second film failed to even come close to the original. How could this third entry with an almost entirely new casts (because it's a prequel) be any good whatsoever? It surprisingly is. 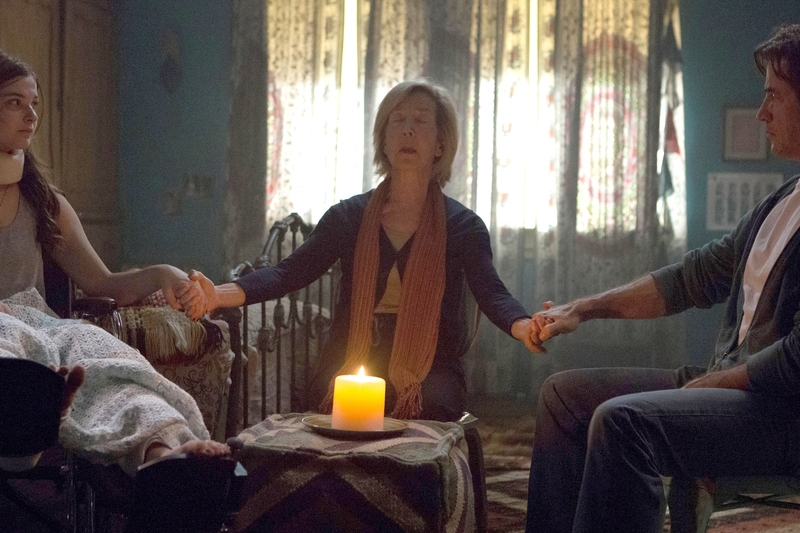 It deepens the story of the likable medium Elise (Lin Shaye) and how she comes to work with those two silly ghosthunters while delivering enough decent scares to keep you on edge. It's wonderful how far Shaye, sister of former New Line Cinema president Bob Shaye, has come in her career. She was basically planting in various New Line movies in tiny roles because nepotism. She's the teacher in “A Nightmare on Elm Street” she's Mrs. “Noogieburger” in “Dumb & Dumber” and she was a flight attendant in “Snakes on a Plane.” Of course, let's not forget her memorable turn as the dog-kissing human leather bag Magda in “There's Something About Mary.” Here, as one of the industry's hardest working character actors she's finally given the standout role practically headlining her own movie at the ripe old age of 71. The story of “Insidious Chapter 3” involves a teenage girl named Quinn (Stefanie Scott) who lives in an apartment with her widowed father and younger brother. She contacts Elise to help her “communicate” with her mother. A short time later, a tragic accident occurs which leads Quinn to be haunted by an evil entity. Elise is called upon, though she previously insisted on being retired, to help the girl after strange and disturbing phenomenon occur. Quinn's dad initially contacts two ghostbusting dudes from the internet, who are Elise's co-workers from the first and second film. One of them is played by Leigh Whannell, who co-wrote all the films and makes his directorial debut here. Taking the reigns from James Wan (too busy directing Furious Seven, who appears onscreen in a brief cameo) Leigh's debut is completely efficient. His film isn't far from the look and feel of the first two films, as many of the same crew members return. “Insidious Chapter 3” feels like it's missing the legitimacy of stars Rose Byrne and Patrick Wilson, but there's actually a welcomed breath of fresh air in this storyline. As Quinn's dad, Dermot Mulroney does a great job of being a likable dad. He's definitely not the typical horror movie dad who doesn't believe the strange and bizarre things going around in his home. The real star here of course is Shaye who makes the film her own. She's 71 she's definitely earned it and actually has the talent to pull it off. Trailer for Insidious: Chapter 3 on TrailerAddict.